Look what I bought over the weekend. I realize you are singularly unimpressed. "Um...Deb? It's a sink basket. Hardly something to blog about." But you would be wrong. Yes, it is a sink basket. It cost me a princely sum of $5.10, with tax, from Ace Hardware. See, the last time I bought a sink basket, I think Bill Clinton was president. It was a plastic thing. It was white when I got it, but I'd had it so long, it had turned the color of dried corn shocks. Last weekend, the seal, the business end, the part that goes into the drain and stops the water from escaping, cracked. It didn't completely break, but, for all intents and purposes, it was now worthless. There was no stopping water from seeping down the drain. It took me 3 attempts at washing dishes before coming to that realization. Sometimes, I'm a wee bit slow on the uptake. I had to go to Target for Pop Tarts (THAT'S an upcoming blog post.) and I scanned their housewares aisle. No sign of a sink basket. I did find brand new drip pans. Those are vitally necessary so I got a set. My other drip pans were so gross. Anyway, striking out at Target, I just didn't have time to go anywhere else to search for a sink basket. I've been traveling a lot and I come home too tired to venture out into the wilds of hardware stores. So the dishes piled up and up and up. I was out of spoons by Thursday and out of pots to cook macaroni and cheese (Hey, it's quick.) by Wednesday. 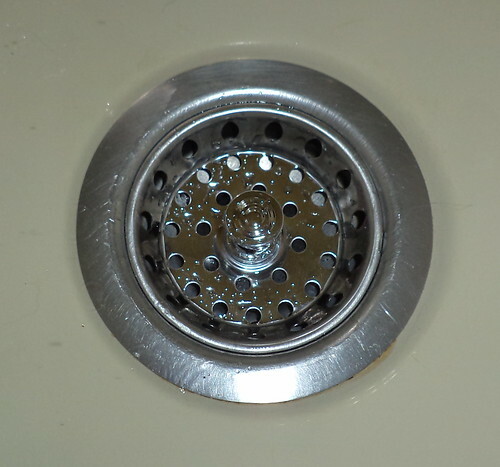 Yesterday, I had to go to Ace Hardware to get garbage stickers and I asked where I'd find sink baskets. "Aisle 21, on the right side." Heavenly days. There were 10 different styles, including the exact same plastic model that had gone in my trash. I opted to get a stainless steel version this time. I have no idea what I paid for the plastic one all those years ago. If this one lasts even half as long as the plastic one did, I will certainly have gotten my money's worth. Best of all, I could do dishes again. I have clean silverware and pots. It's the simple things that make life so enjoyable. Seriously. $5.10 and I'm the happiest person I know.